While this is a cosmic piece of jewellery - it is not made with a meteorite. It is a Sun crafted in solid silver and then set with rich golden enamel. 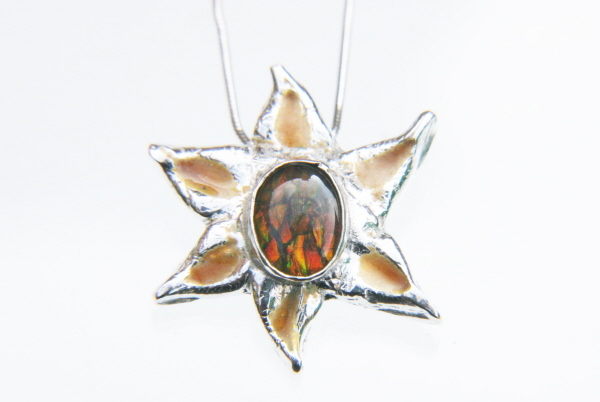 At the heart of the pendant is a cabochon of Ammolite. You may not have heard of Ammolite, and if you havent you are in for a treat! It is one of the rarest gems available to buy and is basically obtained from an incredibly rare type of fossil Ammonite found in only ONE place on Earth. Ammolite is mined in Alberta, Canada and is the shimmering outer shell of a fossil Ammonite that lived MILLIONS of years ago. It is intricately cut and polished,a nd only the best sections are used as Ammolite. People pay many thousands of pounds for the best Ammolite as it has the most incredible shimmering play of colours. When the Sun hits it the colours shift and change in the most amazing way! It is strung from a gorgeous thick 18 inch snake chain. Higher quality than the usual chains I use as this necklace deserves the BEST! Boxed and labelled in a stunning black velvet lined jewellery box - this really would make the ultimate gift for any lover of craftsmanship and natural beauties!